Ok, some people could find this racist, but I found it downright funny! Sue me. Yeah, it’s in West Bengal. Didn’t know? No problem, me neither. The nearest airport is this absolutely nondescript, totally unheard of place called Baghdogra. Sounds funny, no? Anyway, we flew Air Deccan (which, miracle of miracles, was totally on time after the initial delay of 1 hour!) from Hyderabad to Calcutta, and from there to Baghdogra. Darjeeling is another 4 hours by taxi. Believe it or not, the tea gardens start right outside Baghdogra airport. And they vanish for a long time to later re-appear once you’ve reached Darjeeling. The ride up was amazing till we took the ride up (and down) from Gangtok. But that is a later post, this one is about Darjeeling. My first impression about this cute li’l place was that it’s not exactly as cute and little as you would have imagined. It’s this feeling you get when you go to Ooty – too much commercialization, too many vehicles, congestion…and pollution also to an extent. At least by hill station standards, I think Darjeeling is polluted. It was colder than normal, or so I felt. We checked in to the Fortune Central (part of the ITC Group) – the rooms were way above our expectations! But the heating system left a lot to ask for. We finally got the fireplace lit! My first fireplace ever! Heh heh. Lot of firsts in this trip, come to think of it. Tourism is, I think, the mainstay of the people here. Even more than tea and spices. Result? Every small nook and corner of the place becomes a ‘tourist spot’! We were told there was a lake at a place called Mirik and it’s an absolute must-see. Now, for a person who lives in Hyderabad, when I heard the word ‘lake’ I imagined something in the lines of the Hussain Sagar. First mistake. 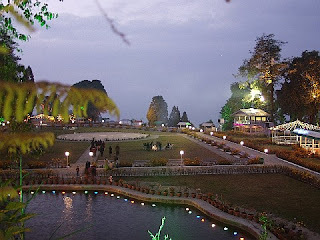 It took us all of 3 hours to reach the lake (the ride was entirely through tea gardens – Mirik is where the best gardens are I guess) – and the lake? It was one fourth the size of Hussain Sagar. Or even less. No big deal, no great shakes. Seemed a bit desperate on the part of the Darjeeling Tourism dept. But hey, maybe for them that qualifies as a proper lake worth being a tourist spot! No harm done. Tall tall tall..so tall it almost reached to the heavens! There were a couple of other such ‘tourist spots’ – a park, called Nightingale Park, which was actually not so bad – only, we were told its a 15 min walk from our hotel. What they apparently forgot to mention was its a 15-min walk UPslope. We people from the plains do not do so well when told to walk up hills, do we? At least I didnt. So I huffed and puffed my way up. It was almost completey dark by the time we reached there (sun sets at around 4:30PM), so we hung around for a while and watched the cultural programs that were happening there. I have no idea what that language was, could have been Nepali. Darjeeling is best seen by walk (ahem ahem). There is a market place with all the usual shops for woollen wear and stuff, not to mention an awesome looking INOX theatre complex. And we watched Casino Royale there!! Seems like the single most important highlight of our trip to Darj. If you ever want woollen clothes, best to buy it from here. Dirt cheap, bargains galore and the quality is not that bad either. No tour is complete without a mention of the local cuisine. Well, Darj doesn’t have any. We had the usual dal-roti-nan types of food (sob story for a genuine foodie like me). 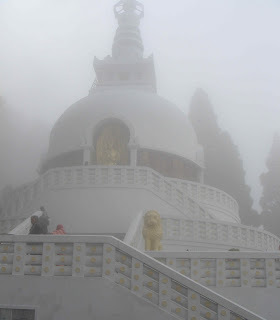 Three places that were good and worth the while – the Peace Pagoda near the Japanese Temple, The Himalayan Mountaineering Institute (HMI) and the Zoo! The pagoda was a treat to the eyes with the huge golden statues of Buddha at various milestones of his life. The HMI is a tribute to the mountaineers of this country. At one point, this institute was managed by Tensing Norgay himself. It has a museum for the Everest expeditions and other such feats. They even have the equipment that Norgay and Hillary used when they conquered the peak. Good one. Himalayan Mountaineering Institute, Darjeeling. Also home to the final resting place of Tensing Norgay. The zoo was small, but interesting. A total kids place, and I saw a bear up close for the first time in my life – I mean really really close. The cheetahs were also up and about, and we were lucky enough to catch a glimpse of a white tiger! We spent 3 days and 2 nights in Darjeeling. And that was actually more than enough, we managed to see all the major tourist spots and got some shopping done too. Oh, did I mention we bought tea? Yeah! we did! Don’t forget the Darjeeling Chai for your morning breakfast – totally amazing and you would know why its a big deal the world over. My broadband connection went kaput. Know why? Some moron decided it would be good to steal, yes steal, a part of the telephone cables (which in turn controls my broadband connection) buried underground. Hey, we’re all tired of the usual reasons of a dead telephone like rains, faulty cables and all that right? So this is a new reason. Theft! Theft of cables! 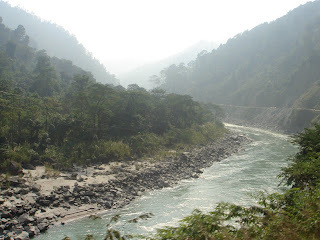 Till then, enjoy this one pic – of River Teesta, that gave us company on our way to Gangtok from Darjeeling. And on the way down from Gangtok to Baghdogra. The pic was taken by my husband from a moving car – good no? By the way, you know a color called ‘aquamarine’? Yeah, that was the color of the river. Aquamarine. It really exists you know, not just a made-up color for cars. I know something’s wrong with this post, but I’m not able to place it! Feels like I’m being possessed by someone and it’s not me writing this! Let me know if you know what’s wrong, please. 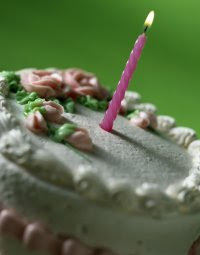 P.S: I’m working on getting the RSS feed up. I have to tinker with the template and right now, I’m just not in a mood to look at code! 😦 So please bear with me, will get it done at the earliest.